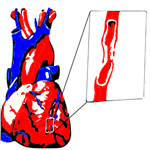 Tightness or pressure as pain, retrosternal or easy to left (“heart hurts”). Occurs quickly during exertion, can extend and lose after the break. After light exercise in 70% of patients abnormal ECG is diagnosed, others 30% have a normal ECG. Angina pectoris is usually caused by arteriosclerotic heart disease, but in some cases there is no significant coronary artery disease and angina pectoris is a result of severe aortic stenosis or insufficiency, increased metabolism, as is the case with hyperthyroidism or after thyroid treatment, indicated anemia and tachycardia with a rapid ventricular beats. The essence of the mechanism is in the discrepancy between requirements of myocardial in oxygen and the amount of oxygen passed through the coronary arteries. Factors include atherosclerotic vascular stenosis, collateral circulation and reflex constriction as a response to emotional state, cold or gastrointestinal disease in the upper parts. Blood factors are consist of anemia, hypoxemia and polycythemia (increased viscosity). Circulatory factors are reflected in the fall in blood pressure due to arrhythmia, hypotension, hemorrhage and Valsalva procedure, as well as reduced pressure at filling of the coronary arteries because of aortic stenosis or insufficiency. 2) Increased cardiac output of angina pectoris Physiological factors are stress, excitement, disturbance of digestion and metabolism after heavy food. Pathological factors are (as high output) including anemia, thyrotoxicosis, arteriovenous fistulas and pheochromocytoma. 3) Increased myocardial oxygen is caused by increased heart rate, as in aortic stenosis or insufficiency and diastolic hypertension, or because of increased oxygen consumption due to thyrotoxicosis, or because whatever condition which is characteristic for increased excretion of catecholamines (pheochromocytoma, severe emotional states and hypoglycemia). During cardiac catheterization, physiological changes occurs, which are leading to angina pectoris, which is, in fact, the same as angina pectoris caused by prolonged exercise. The significant increase in left ventricular pressure can be seen and before the ECG can show signs of angina pectoris and ischemic changes. The oxygen consumption is increased in the myocardium. These changes go in favor of left ventricular failure and reduce suspicion of occurrence of angina pectoris. Angina pectoris usually occurs during walking, especially along the slope, or when you climbing the stairs. Fatigue with exertion leads to closure of the glottis and thorax accelerate the attack, feels like your heart hurts. Depending on the type of activity, angina pectoris occurs during fatigue and stops when the patient is standing or sitting quietly. Patients prefer to remain in a standing position. Some patients feel easier after vomiting and therefore tend to attribute their difficulties to difficulties in the stomach. Angina pectoris is more intense after the lunch, during arousal, or when a person is exposed to a cold wind. Heavy meals and strong emotional states can trigger an attack, even without fatigue. Patients often do not complain because of pain due to angina pectoris, but feeling of tightness, burning, pressure, choking, pain, stretching, the presence of gas or tension is that bothers them. Often is associated with disturbances of digestion. Attack of angina pectoris never occurs in the form of clearly localized pain or pain which be can be determined by finger. Angina pectoris occurs rapidly during stress and rapidly increases in intensity until the patient is forced to stop and take a break, even if at the beginning, the problems are not too severe. Localization of pain is different in many patients, but it is still the same in one patient. Discomfort is part of the feeling behind and to the left of the sternum. When pain begins a little more to the left, or not so often to the right and characteristically moves centrally and you can feel the pain deep in your chest. Although angina pectoris can spread to every segment, from C2 to T10, usually extending to the left shoulder and upper arm, and often moves down to the inside of the hand and elbow, wrist, or to the fourth and fifth finger. Sometimes, in the beginning, angina pectoris can be felt in the lower part of the jaw, in the base or back of the neck, or high left in the back. Angina pectoris almost certainly can be ruled out in those cases where the patient shows one side and with the finger point at the most painful place. During spontaneous or induced attacks, systolic and diastolic blood pressure are significantly increased, occasionally, only during the pain, and accelerated heart rhythm occurs. Carotid sinus massage often leads to pain, but it loses much faster than usual if you slow down the heart rate. This procedure is very useful in cases of atypical angina. It is important to detect signs of diseases that have a stake in atherosclerotic heart disease. 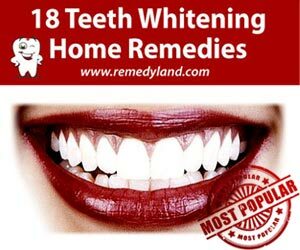 These include: diabetes mellitus (retinopathy or neuropathy), tuberosa, or changes which are increasing angina pectoris, such as hypertension, thyrotoxicosis, hypotension, and aortic or mitral stenosis. 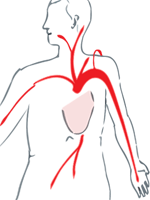 Patients with angina pectoris have normal cardiovascular system in 25-40% of all cases. You can observe also occlusive peripheral artery disease, hypertensive retinopathy and cardiomegaly, significant murmur and signs of heart failure. It is necessary to make a image of the chest to exclude disease of the lungs, heart and bones. ECG at rest is normal in 25% of patients with angina pectoris. Changes are manifested by abnormal atrioventricular or in intraventricular system, by left ventricular hypertrophy, old myocardial infarction, or by the non-specific changes in the STT segments. If the diagnosis is doubtful, it is necessary to conduct the fatigue test (exercise test). Fatigue test must not be conducted before it is determined that ECG at rest is normal and that the character of pain is not fresh. These measures are necessary to prevent stress in patients with acute or subacute myocardial ischemia. A positive fatigue test means that the ECG horizontal depression is at least three mm long or definitive depression of a whole ST segment in one or more leads. Depression of the ST segment (“J”), alignment of T wave or small depression of ST-segment are not used for diagnostic purposes. In standard test, significant changes occurs only in 50-60% of angina pectoris patients. The percentage is much higher if the ECG is taken during a spontaneous attack. Increased experience has shown that angiography is a relatively safe method, and angiography demonstrate the anatomical changes in the coronary arteries. However, some patients with angina pectoris have normal angiogram, so angiography can not exclude coronary disease. Psychophysiological cardiovascular reactions are neglected group of signs of heart diseases with chest pain, they are increased with fatigue, but they do not stop at the rest. 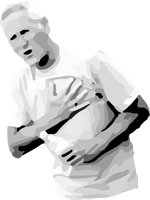 Often there is a short lasting pain in the form of knife stabs on top of or over the precordial. Emotional stress and fatigue makes the pain more difficult. Dyspnea is often present due to hyperventilation, palpitations, fatigue and headache. Common patient complaints are the constant exhaustion. “Syndrome of the anterior chest wall,” is distinctive because of clearly limited intercostalis muscle pain, pressure which reproduces chest pain. Inflammation of joints, which are warm, swollen and red (so called Tietze syndrome) produce a diffuse characteristics of pain in the chest, which is also caused by local pressure. It is difficult to establish the diagnosis because of intercostal neuritis (herpes zoster, diabetes mellitus, etc..). The sensitivity in the xiphoid area increases, as well as the pain in your lower sternum, they can be renewed with pressure on the processus xiphoideus. Both can occur in patients with angina pectoris. Cervical or thoracic spinal cord disease (degenerative disc disease, arthritis, cover the dorsal pathways) produces sharp and severe pain similar to angina pectoris by localization and diffusion, but he is conditioned by particular movements of neck or spine when you are lying or driving. Anginal pain is often mistaken for peptic ulcus, cholecystitis, cardiospasm and functional gastrointestinal disorders, because some patients have relieve of anginal difficulties after vomiting. In these disorders, the symptoms are related to food intake and not related to fatigue. Radiography is helpful in diagnosis. Pain despairs with proper diet and medication. A hiatus hernia pain occur in the lower parts of the chest or upper parts of abdomen and usually because of abundant food, in lying down or bending position. The pain calms with mild diet, antacids, semi reclined position and with movement. Mitral stenosis or pulmonary hypertension as a result of chronic lung disease can occasionally cause pain in the chest that is no different from the pain of angina pectoris, including flattened ST segment. Clinical picture of mitral stenosis or pulmonary disease is evident , ECG shows electrical axis deviation to the right, or open hypertrophy of right ventricular. The pain is extended with frequency and intensity of attacks, accented occasionally by complete remissions and episodes of myocardial infarctions, or they end in sudden death. Average survival after an attack of angina pectoris is 8-10 years, and the annual mortality caused by angina pectoris is 5-8%, beyond what is expected based on age and gender. Life expectancy is also shortened by diabetes mellitus, hypertension, cardiomegaly, congestive failure, myocardial infarction and arrhythmias. Poor prognosis have patients who have suffered from angina pectoris attack before 40 years of age. Half of the patients died suddenly, and 1/3 after myocardial infarction. Patients with typical angina pectoris usually have attacks from time to time and the attacks just after going to bed or attack can wake them up. In a sitting or standing position, the pain slowly release. Such episodes are brief and frequent. If these changes suddenly appear at night, and especially if the pain returns at night, you must find condition that increase angina pectoris. If, however, there was no finds, this type of decubitus anginal pain occurs before myocardial infarction, and the mortality rate is high if the patient is not treated for preinfarction angina. Aggravating factors such as emotional stress and thyrotoxicosis should be treated carefully because they represent 5-10% of cases. A large percentage of patients with prolonged anginal type of pain are diagnosed with myocardial infarction and died suddenly. Others are suddenly calm down and become asymptomatic. Only a few still have extended pain in the chest, probably due to myocardial ischemia, with no evidence of myocardial necrosis. A sudden attack of angina pectoris. The rapid rise of the frequency, intensity and duration. The sharp change in the place or radiation. Nausea or vomiting associated with pain. Continuous or repeated angina decubitus. Arteriosclerotic heart disease or coronary artery atherosclerosis is the most common underlying cause of cardiovascular events and death. One stop station for questions about hypertension or high blood pressure.